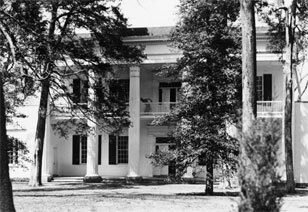 The Hermitage, Andrew Jackson's world-famous plantation in Nashville, Tennessee. Library of Congress, Prints and Photographs Division, LC-USZ62-101095. Of grave concern to the Black Seminoles in 1815, Andrew Jackson was an ardent defender of slavery. As a politician, he would later maintain a deliberate vagueness on the issue, yet his actions in defense of the institution were incontrovertible. Historians have speculated that slavery was always the hidden issue behind Jackson's political fortunes. Whether or not this was true, in 1815 he was on the verge of establishing himself as the champion of the southern expansionists. He dreamed of gaining for the U.S. all of the territory in Spanish North America -- Florida, Texas, and the West. Here, slaveholders saw an expanding platform for their peculiar institution and a hedge against Northern power. The country had some obstacles before it could expand, however, namely, in Florida, Spaniards, Indians, and free blacks.